One of many cut outs on the "support" bulletin board assembled by Battle High School's student-led Gay-Straight Alliance. 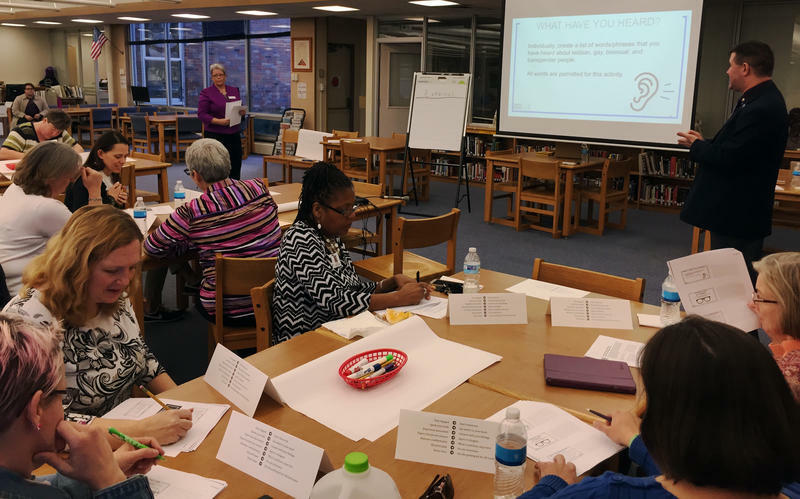 About 20 educators from across the District showed up to Hickman High School’s Media Center to hear trainers Bonnie Augusta and Frank Burger talk about how teachers could create safer school environments for all of their students. Burger has been leading trainings since they started in 2005, and he said teachers want to talk about these issues, but sometimes they don’t know how. Bonnie Augusta (left) and Frank Burger (right) lead Columbia Public School teachers in a workshop on creating safe schools for LGBTQ students on Wednesday, February 17, 2016. At this training, Burger and Augusta led the teachers through a number of activities designed to have them think about and understand how issues of sexuality and gender play out in their schools and affect their students. They also had the teachers draw up plans with actions to create safer schools, ranging from putting up safe space signs in their classrooms to multiyear activities and policy changes. Augusta said that Columbia teachers are like many others she’s worked with in that they are interested in how to support transgender and gender nonconforming students. “It's that teachable moment right now, and [teachers are] hungry for that,” she said. Kirchhofer said she learned a lot about the experience of transgender students when a student lived with her after being kicked out of his home. “He presented as male and I think most people assumed he was a boy,” she said of Evan, whose real name she didn’t want to use to protect his identity. “I think many people at his high school knew that he wasn't [assigned male at birth] because every time they read class roll or a substitute teacher was there, they would say, ‘Haley. Where is Haley?’ and he would raise his hand. Battle High School students posted who and what they support on a bulletin board assembled by Battle's student-led Gay-Straight Alliance (GSA). GSA advisor Kirsten Siegel said it was nice for students to see that they were supported by their classmates. Kirsten Siegel, a geometry teacher at Battle High School, attended the training as one of the sponsors of Battle’s Gay-Straight Alliance (GSA) student club. Siegel sees the same issues with roll call that Evan experienced with Battle’s transgender students, and was hoping to learn more about the District’s new policy regarding transgender students. She said a lot of faculty she’s talked to are unclear about what the policy means for their classrooms, which leads to continued issues for students. “If you're a student in class and you're called he all the time because that's what it says on the roster but you don't identify as a boy, that's rough to have all of your authorities, all of the people you're supposed to look up to as role models not even recognize your individualism,” Siegel said. According to District spokeswoman Michelle Baumstark, the policy change reflected what the District was already doing to provide appropriate accommodations for students. Lennon and Greg Kirchhofer, the advisors of Hickman and Rock Bridge High Schools’ GSAs, respectively, both said that curriculum coordinators had met with their student groups this year and asked the students what changes could be made to the curriculum to better meet their needs.